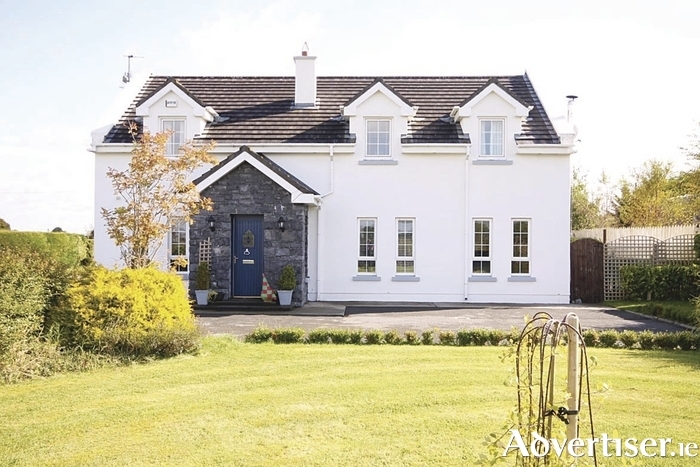 DNG Maxwell, Heaslip & Leonard is offering a wonderful opportunity to acquire an outstanding four bedroom detached house located in the beautiful countryside setting of Gort Ard, on the outskirts of the lovely village of Clarinbridge, only 10 miles south of Galway city. It is close to all amenities and many excellent restaurants in the nearby Clarinbridge village, including the famous Moran’s of the Weir. Situated on a site of c0.9 acre of landscaped gardens and driveway, which includes a shed and beautiful private decked area, this substantial house comprises c2,170sq ft of living space. Owner-occupied, which is evident from the attention to detail throughout, the property is in excellent condition and is being sold with many extra features such as ground floor bedroom, guest toilet with shower, master en suite and walk-in-wardrobe, marble tiling, and beautifully landscaped gardens. Ground floor accommodation comprises an entrance hall, living room, kitchen/dining room, ground floor bedroom, office/sitting room, guest toilet with shower, and utility room with feature half door. The first floor has a spacious landing, fully tiled bathroom, and three double bedrooms, with the master bedroom having the convenience of both an en suite bathroom and a walk-in wardrobe. Viewings are by appointment and may be arranged by contacting any of the residential sales team at DNG Maxwell, Heaslip & Leonard on 091 565261.